Network Calculus is a set of recent developments that provide deep insights into flow problems encountered in the Internet and in intranets. The first part of the book is a self-contained, introductory course on network calculus. 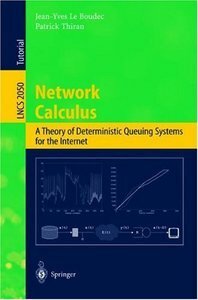 It presents the core of network calculus, and shows how it can be applied to the Internet to obtain results that have physical interpretations of practical importance to network engineers. The second part serves as a mathematical reference used across the book. It presents the results from Min-plus algebra needed for network calculus. The third part contains more advanced material. It is appropriate reading for a graduate course and a source of reference for professionals in networking by surveying the state of the art of research and pointing to open problems in network calculus and its application in different fields, such as mulitmedia smoothing, aggegate scheduling, adaptive guarantees in Internet differential services, renegotiated reserved services, etc.